Of blue skies and labradors. Flowers and aqueducts. San Pedro de Merida to Merida. 10 miles Flat. Over the last bit of well tilled flat Spanish countryside to the city of Merida. 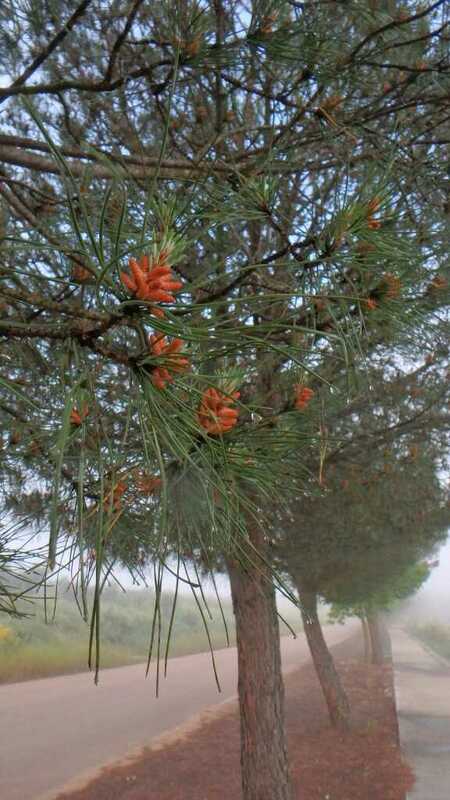 It is typical Spanish spring day cool damp and misty at first then clear blue skies warming up gradually. 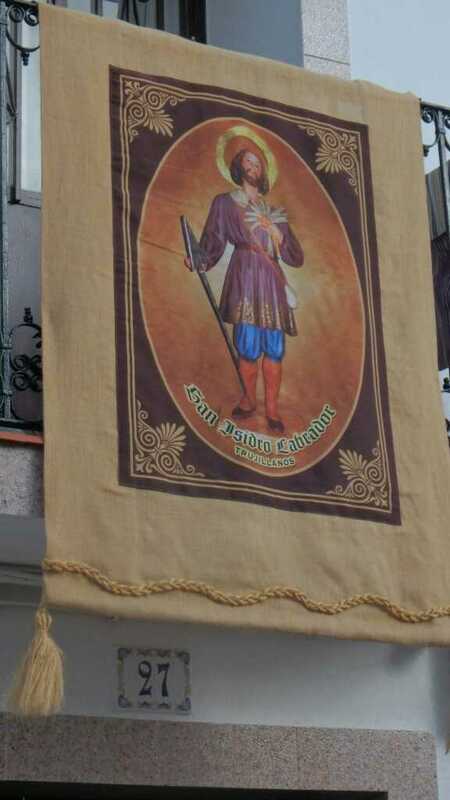 We soon get to Trujillanos a small town preparing for the feast day of it's saint. San Isadore the Labradore. Patron Saint of Farmers. He was a pious generous farm labourer in 13th century who gave away much he owned including food to animals birds and the poor. His son was saved from drowning in the well by a miracle. Isadore and his wife swore chastity and lived separately in thanks. The boy died as a youth, sadly living a good life does not make you imune to the slings and arrows of outrageous fortune. No bars are found open and the village seems to be paused, drawing breath before festivities begin. For such a small place the giant astroturf covered traffic island seems incongruous but it does mean visitors know where they are. Several groups of cyclists wish us Bon Camino as we wander across the Camino Agricola. This is nothing to do with Roman emperors but simply a farm road, the warning on signs being for tractors etc. 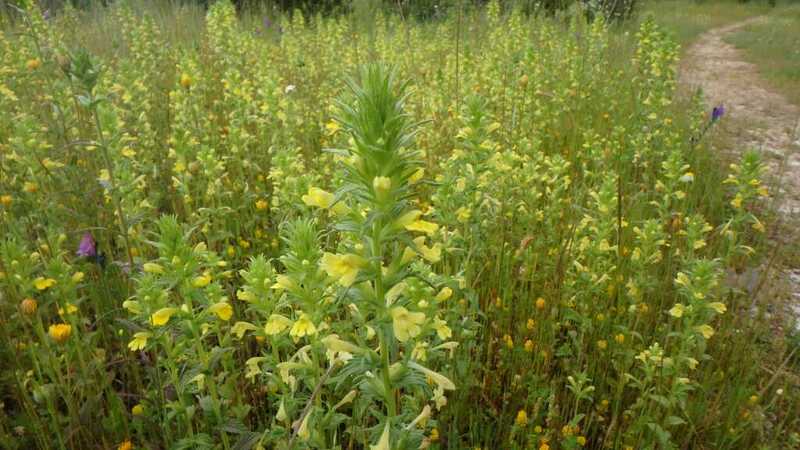 The flowers at the field edges are still in bloom but within a coupleof weeks it will be drying out and only the organised irrigation of the area will keep crops growing. 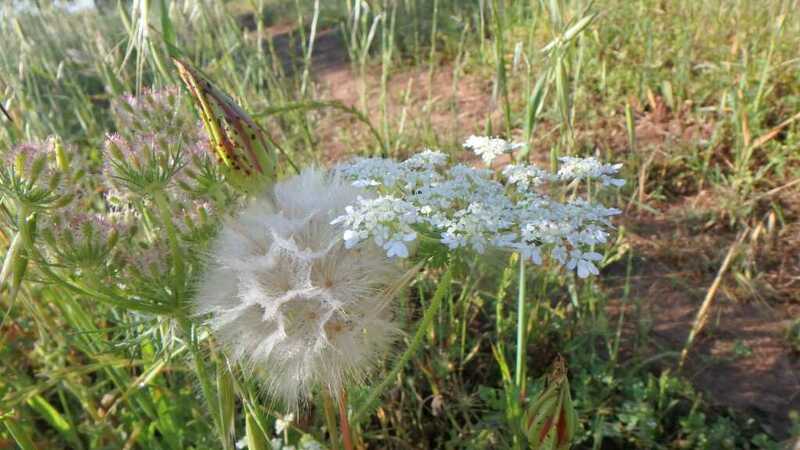 Some plants have already set their seed and are waiting a fair wind for distribution. 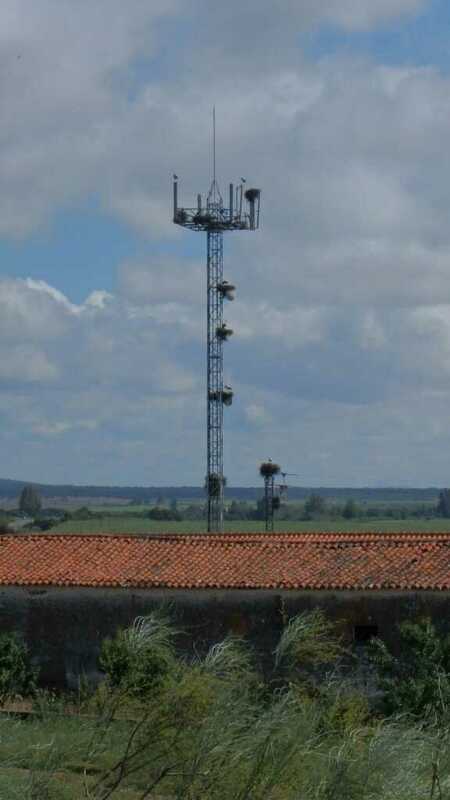 More hoopoos and magpies of both types are seen as well as the church of San Isadore who would have welcomed we are sure the dozen or so storks nesting with young on its roof. We arrive in Merida and realise that even the three who have been here before have not seen this the second Roman aqueduct of the city. Tim feels at home when he spots the round about with the large fallen Roman column in its centre and we have the Menu de dia at one of the many restaurants. Big city prices at 12euros a head but still vino tinto included. Tony easily finds the three bedroom apartment he and Betsy rented for us for two nights and we settle in. 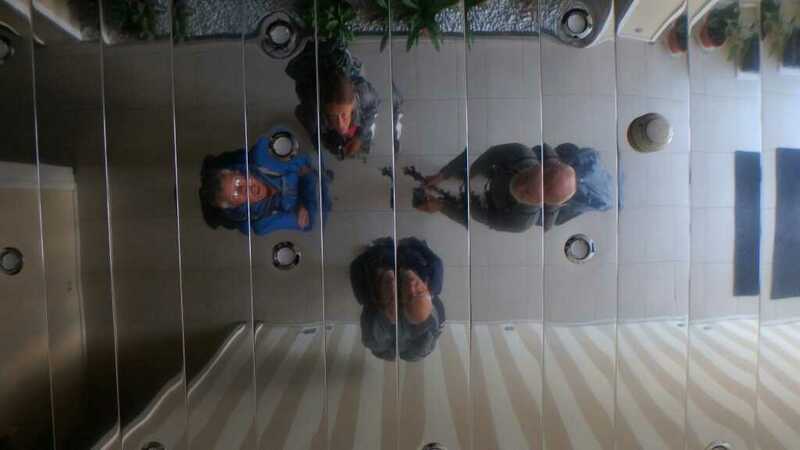 Team work solves the problems of persuading the gas water heater to ignite and provide hot showers, so when Ray returns from a slightly rapid visit to the museum (early closing Sunday not open Monday) he gets his shower without effort. The apartment is perfect for pilgrims a treadmill on the balcony provides support for those who just can not stop walking. None of us utilise it. A day in Merida tomorrow and then bus to Madrid and a flight home. It seems odd not visiting Santiago but this is how many Spanish utise the Caminos. 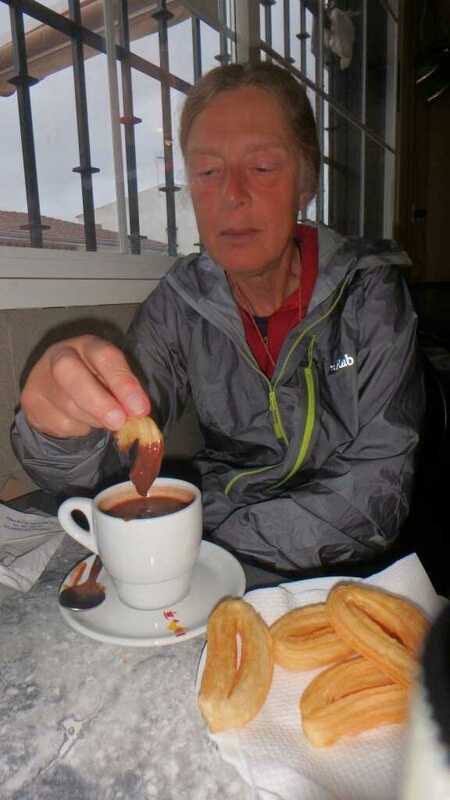 One man we met freely admitting to going on Camino when his mother in law visited. A pleasant DRY amble across the fields. ﻿Saturday Santa Amalia to San Pedro de Merida 12 miles flat. 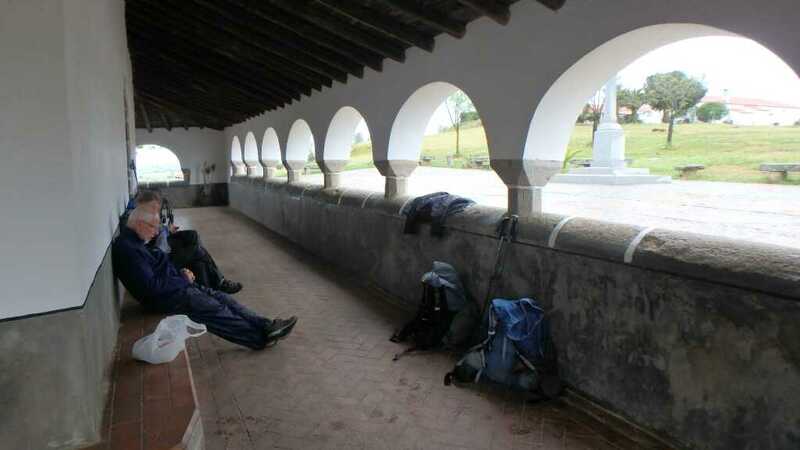 We are out of the very comfortable Hostal Fuente de la Magdalena on the main plaza in Santa Amalia by 8am after breakfast in the cafe open from 6. 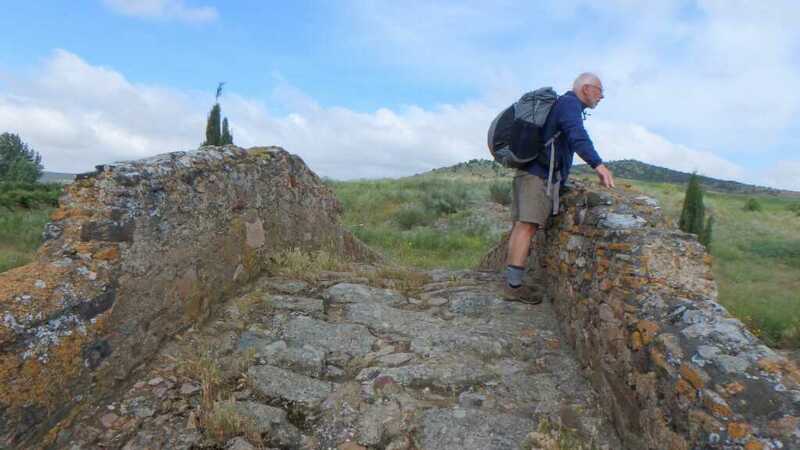 The first part of the walk is down the bank of the Rio Burdalo a tributary of the Guadiana flowing to Merida. We heard many different bird songs in the trees and reedbeds nut see non of the participants. We do see along the Way 11 probably Griffon Vultures wheeling up on thermals, a few black kites, several hoopoos and a good few azure winged magpies. We investigate frog noises in various concrete sluices on the irrigation channels. 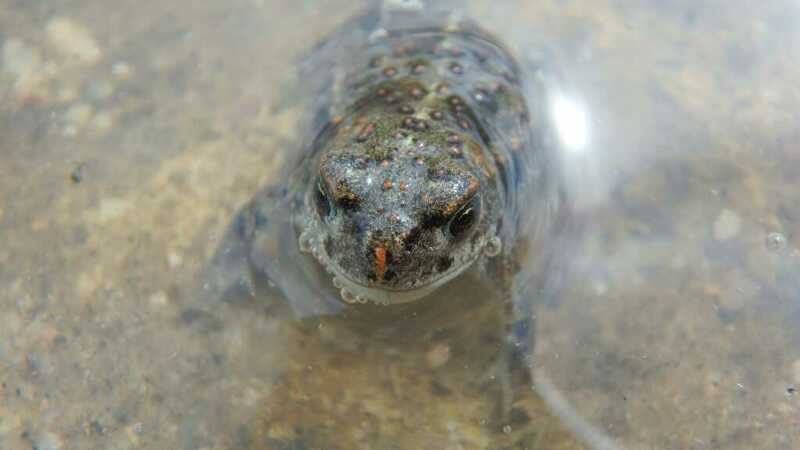 Only glimpses of frightened amphipians surprised in these amplifying chambers are obtained. We think they consider we are storks shopping for baby food. The dryness of the weather seems t increase the ingress of small bits of gravel into shoes or msyne its just more pleasant to stop and empty shoes when its not raining. 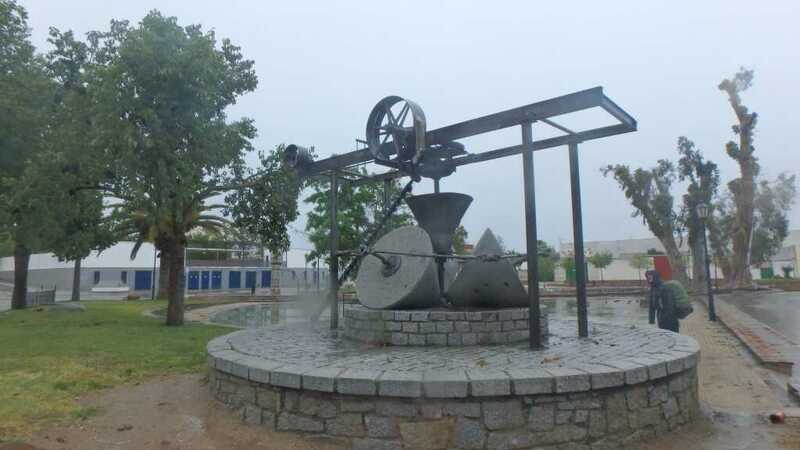 After coffee in Torresfresnada we are walking along metalled side road beside the main Madrid to Lisbon highway, audible but not visible. Eventually we reach the small town of San Pedro which has almost as an annex a thriving service area with two or three hostals, restaurants and a fuel station or two. They are not really geared for pilgrims and washing is hung to dry in a convenient olive grove just over the slip road. Ciconia Ciconia the White Stork. Tony and Betsy have been photographing these birds everyday since we encountered them once we moved out of the dry coastal 100 miles or so. From just before Granada onward they have been a constant presence. These birds are sub Saharan migrants that were in decline in Spain before conservation measures produced a good recovery. We have enjoyed seeing the occupy their traditional rooftops on churchs and chasing frogs in irrigated fields. The beak clacking and aerial displays between partners and other close nesting couples are great viewing. We have seen multiple nest sites on single buildings ofter also occupied by sparrows as lodgers. The final picture is of three well placed storks. Unlucky for some but not us. ﻿Friday 13.5.16 Don Benito to Santa Amalia. 13 miles. Flat one unexpected ford. Unlucky for some but not for us. An excellent day walking, it failed to rain until we were in lodgings. Mud not glutinous. 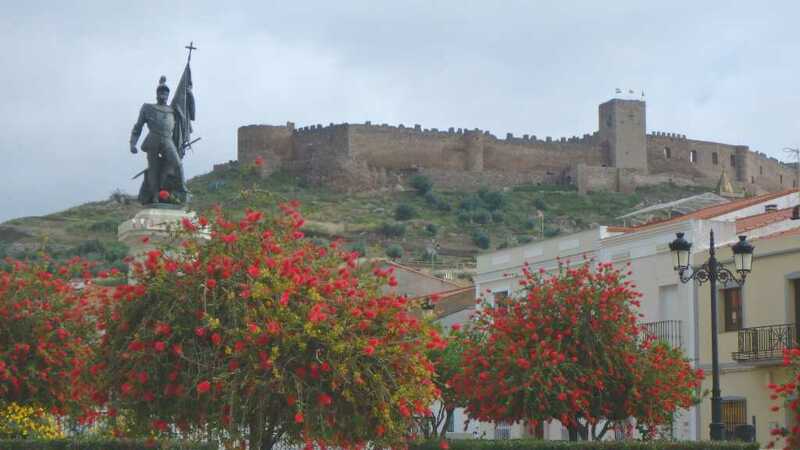 The town of Medalin at a perfect distance from the start had a bar open for coffee in the main square with a statue of Hernan Cortez (his birthplace) and under the large medieval castle and a church with tthe highest stork density yet. Much flying beak clacking and a possible aerial courtship. There is also at least one pair of kestrels or lesser kestrels nesting on the church as well as all the sparrows and others lodging in the understories of the storks nests. Altogether a very pleasant place for coffee. We leave over "the Roman bridge" in this case there has been a bridge here since roman times. 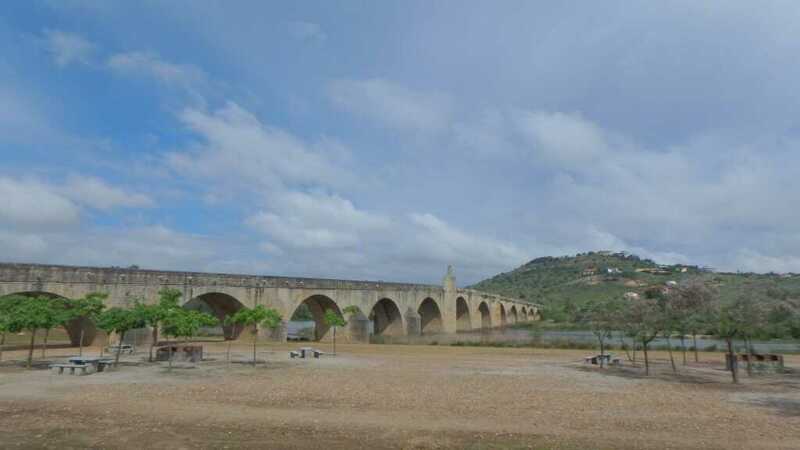 It crosses the Rio Guadiana which flows to our destination Merida and then to Badajoz becoming the border with Portugal and finally emptying into the Atlantic West of Cadiz. We soon pass within 100m of a proper Roman bridge with original main stone arch and only non structural repair over the last millenium or so. The route then continues along a via pecuria (sheep drove road) with much bird life. Spotted a black winged stilt (Tony), a Pied Flycatcher (Betsy),storks and hoopoos (Tim and Ray ). 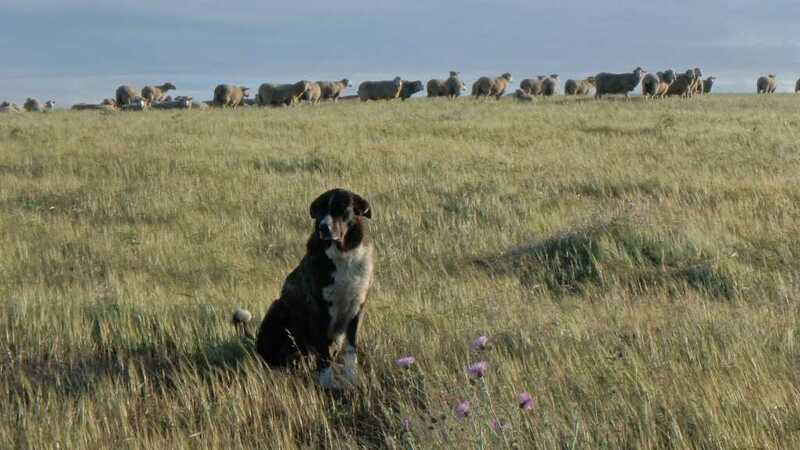 We are acosted by a shepard with his herd in a field alongside the very well cared for irrigation channel we think he trys to tell us of a shorter route to Merida and asks if we will be there tomorrow. We think two days to get to that Roman city. 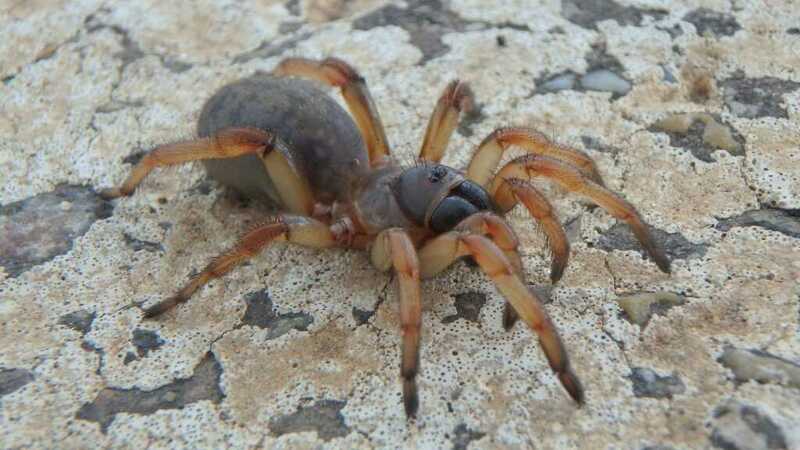 Also in the sluices controlling the irrigation of the fields are numbers of fine spiders. As well as the previous birds we see multiple bee eaters in the fields just over ther iirrigation control bank. On entering town Betsy recognises the name of a restaurant El Caribe recomended by Hans many days ago, the hospitalero on the night outside Cordova. True to his advice there are multiple large trucks parked outside. A sure sign of a good lunch and so it proves. Two bottles of inclusive local red later we move off into town. 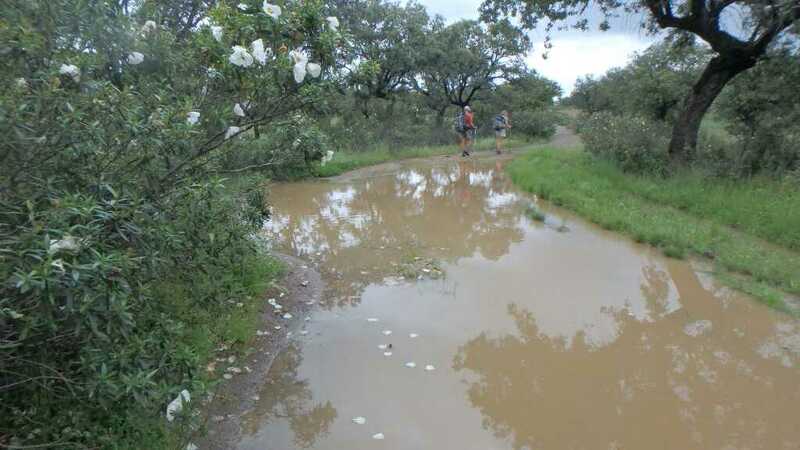 The guide book warns just outside Don Benito of the fast road and narrow bridge this was unpleasant, but nothing compared to the perils of the junction, crash barriers, two drainage ditches and main road between El Caribe and the rest of Santa Amalia. It is however obvious others have sucessfully negociated these perils before us, tracks down and out of the ditches are obvious. Timing is important. 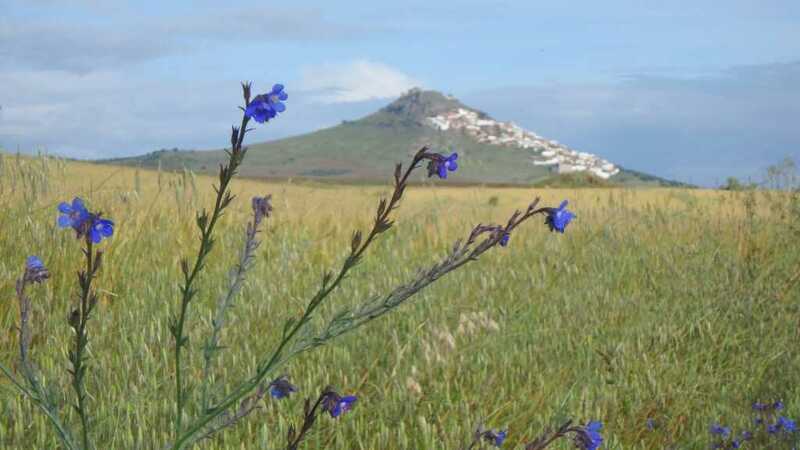 Thursday 12 .5 Campanario to Don Benito 16miles pretty flat. The Railway Station last night was very comfortable, no trains disturbed our rest although one passed about 8pm and one in the morning before we left at 7.45 crossing the line quickly before the next one arrived. The weather looked ok and the forecast was for rain about midday. Opinions differed as to appropriate apparel. Those opting for full wet weather gear winning hands down over the course of the day. We see many more storks on our way to the Lonely Mountain. Well we had not miraculously entered Middle Earth it just seemed like it. The castle atop the hill on which Magacela, our first chance at coffee and tostados, is perched resembles this from a distance and we had plenty of distance to admire it from. 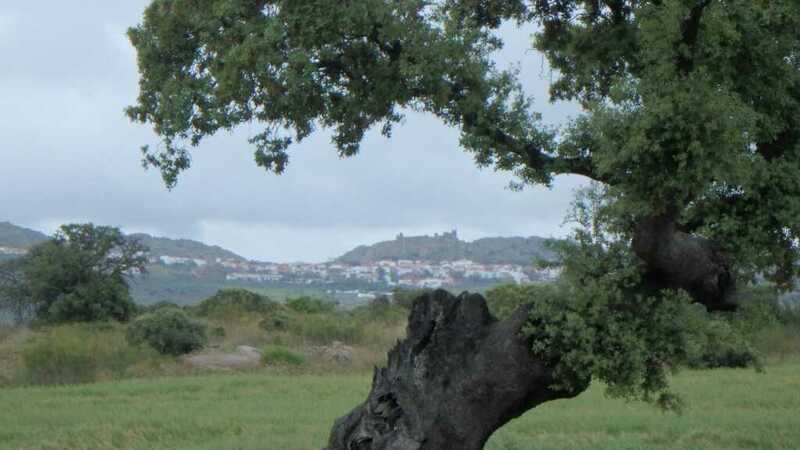 The hill up through town gradually discloses the superb view and every house on the roaf up could claim the name Buena Vista, at the top is the social club and home for the elderly. One really might not mind living there even though the part of the view we thought was a lake was in fact a huge set of solar panels. Tony spots a toad lurking in a puddle but he is hiding in the mud when Betsy gets there. 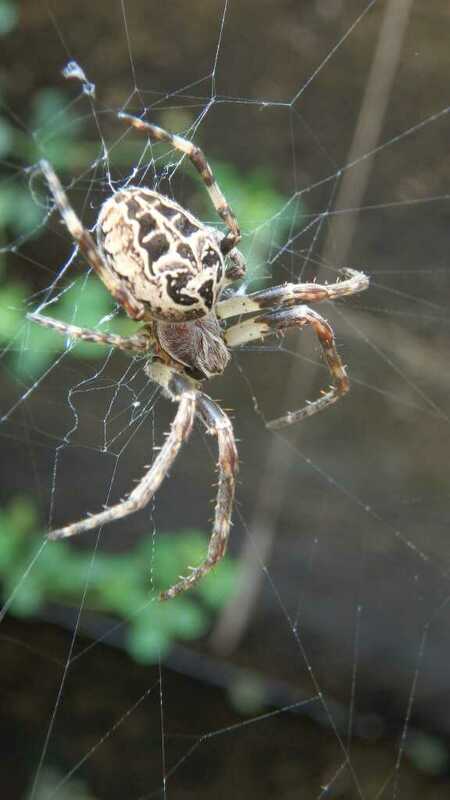 A charm of goldfinches, multiple azure winged magpies, and a very large spider at the edge of the road completes the countyside report which consists largely of arable field with occasional olive groves rather than the Holm Oak dehesa we have been accustomed to. 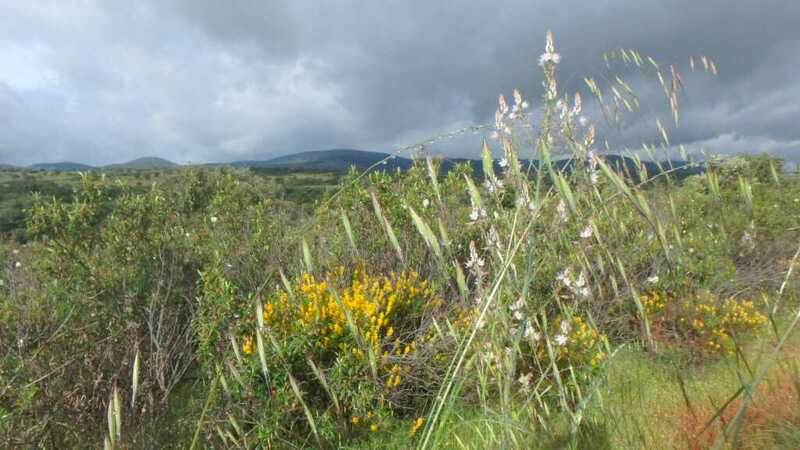 We have reached the edge of the Serena that area of granite on the border of Estramadura. 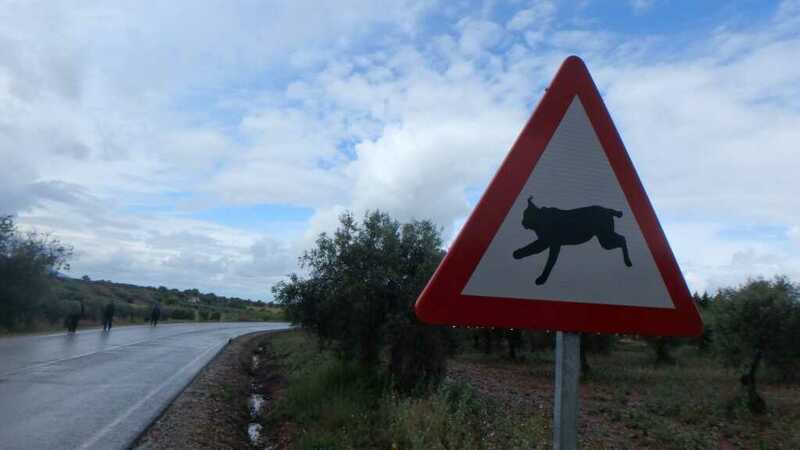 On the road we see a curious sign warning motorists of the presence of the Iberian Lynx sadly we see non, alive or flat. 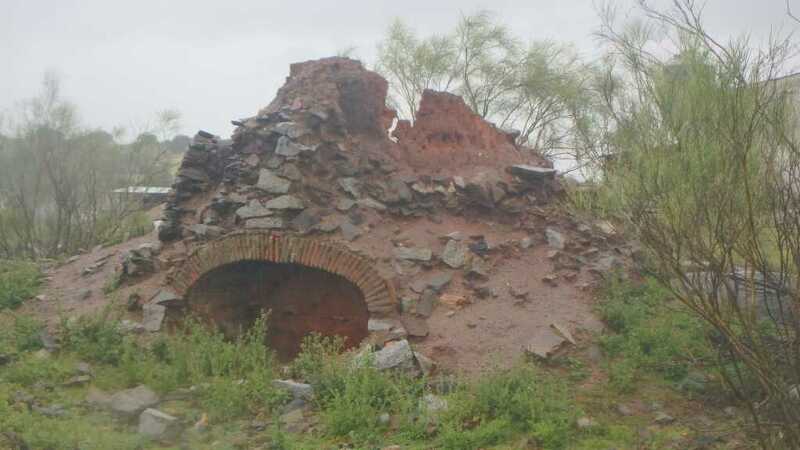 The air clarity is very good in between rain showers but between Megacela and La Haba ( the bean) a small village with an open bar the going is heavy with more fertile fields producing more glutinous mud. The bar is friendly, locals drop in for beer or stronger. One gives us a handful of broad beans and proceeds to demonstrate how to peel them to ignorant foreigners we eat a few to show cross border solidarity. More than we could manage with the tapas, bits of pigs ears and unmentionables in a sauce. Oh we did manage the chips with them. We leave the bar after being overtaken by the two Irish ladies who also stayed at the station last night. 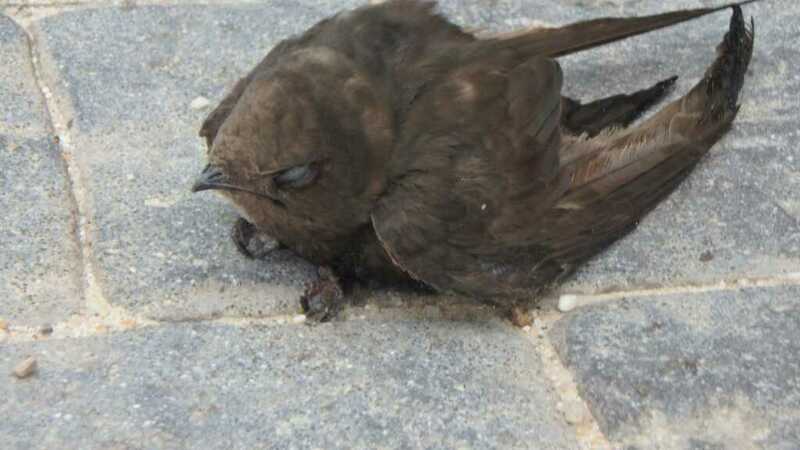 Within five minutes a cold wind is blowing hard and near freezing rain starts Tim spots an unfortunate young swift caught unawares and blown to the ground we hope he will survive. We are soon in open country those in full wet gear are head down happy. Tim has shorts and sandals and is less than comfortable. 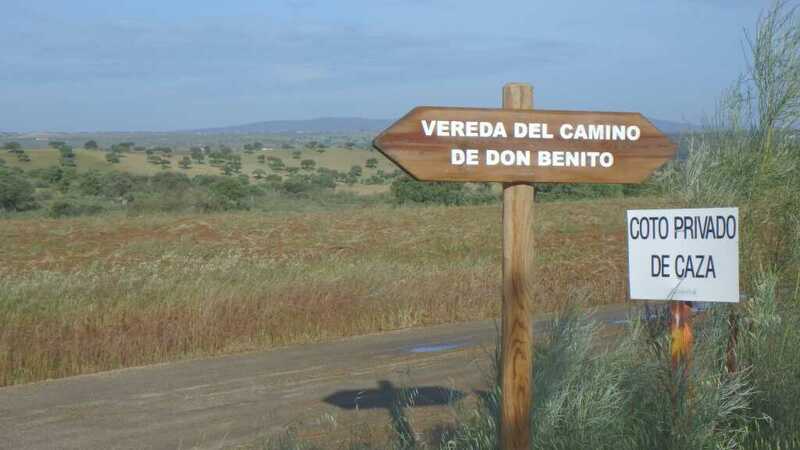 The rain lasts half an hour clearing quickly and the sun is out as we enter Don Benito, who he is we may find out this afternoon. 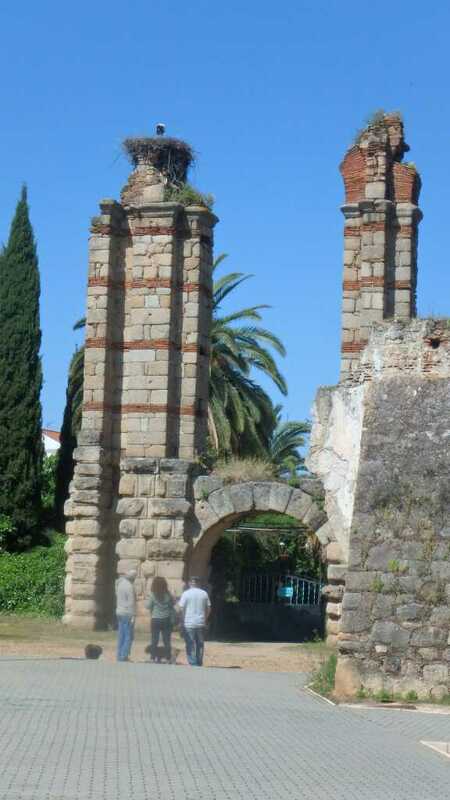 We head to the centre of town with a sizeable church dedicated to Santiago and not much further along we find Hostal Galicia a recommended stop for those on the Way. Even if as us you are not going all the Way, or even to Galicia. The birds and beasts of the field. Wednesday 11.5.16 Castuera to Campanario. 15 miles pretty flat. The forecast for today is a Ralph. Tony's son can forecast weather with 70% accuracy. "Same as yesterday". It does seem that weather comes in blocks, yesterday was dry in the morning, raining by late afternoon. Today may be the same. But we head off into sunshine. We hand the keys to the albergue back to the policia locale thanking the bright alert young policeman on duty. We must have been unlucky yesterday! Spirits are high an average distance planned, accommodation at least possible, just outside town on route. 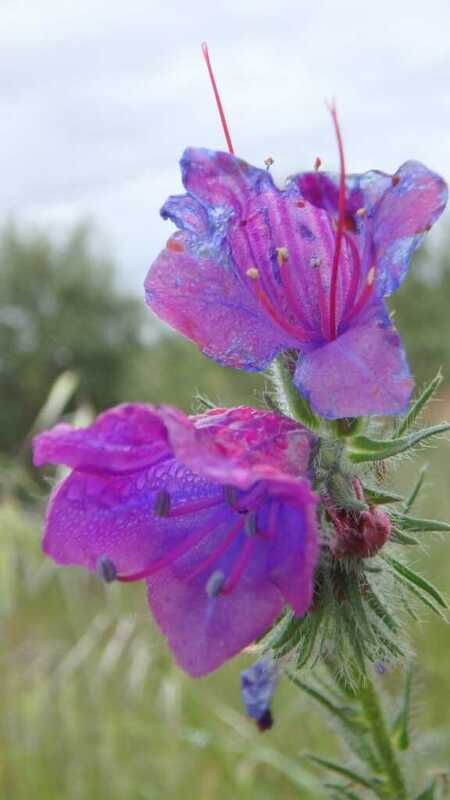 Flowers are singing birds blooming as we scurry along. 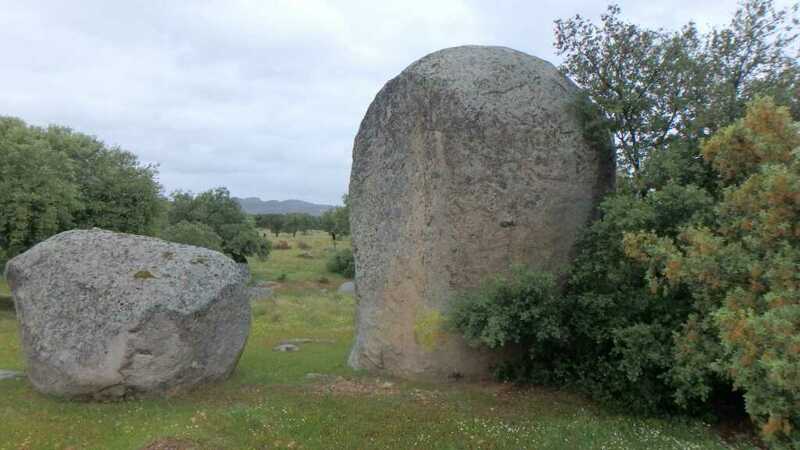 Landscape is dehesa with cereal field mainly, some have large piles of stones removed we presume by generations of farmers. Occasional large granite boulders still provide a good place to eat mid morning oranges. At one point a large bird takes brief flight. A stork maybe it settles and flies again as we approach. It is huge. An eagle disturbed from its night roost. It is most probably a Golden Eagle possibly a first year juvenile with prominent black and white under wings fooled us for a moment. Betsy wonders if it will return to eat her or if it takes lambs, a really big bird. We are passed, off in the pasture around the verana by a herd of sheep two shepherds and a dog. Plenty of lambs about. Later we see increasing numbers of storks and then Tony spots the reason, a tree or two are covered in active stork nests. The multiple small fords we cross on the grit road are full of small frogs providing a ready source of food. As close to stork heaven as it gets we reckon. 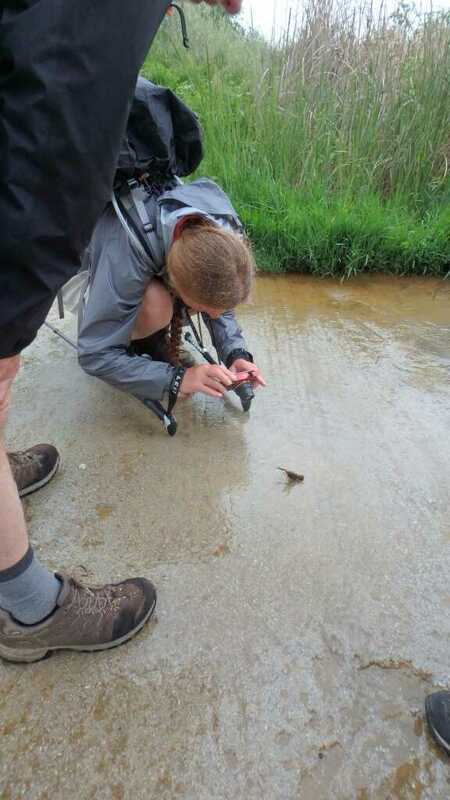 Just before we enter town we are crossing an area of multiple pools when we see the bodies of two enormous tadpoles. 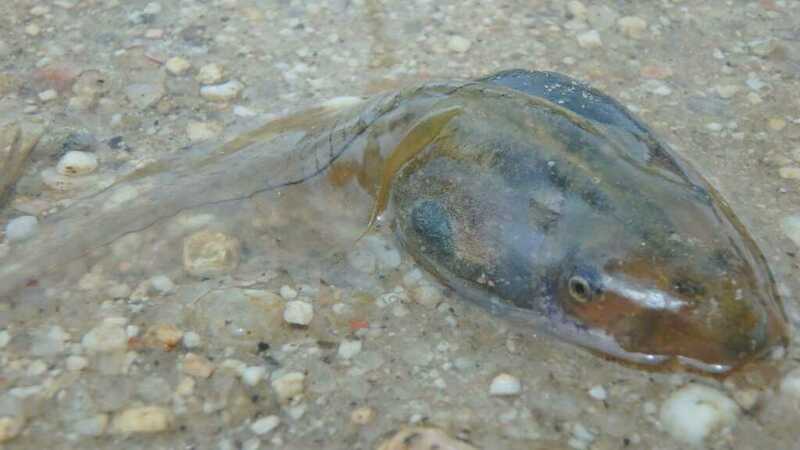 Looking more like jellyfish than amphipian precursors they are two or three inches long. 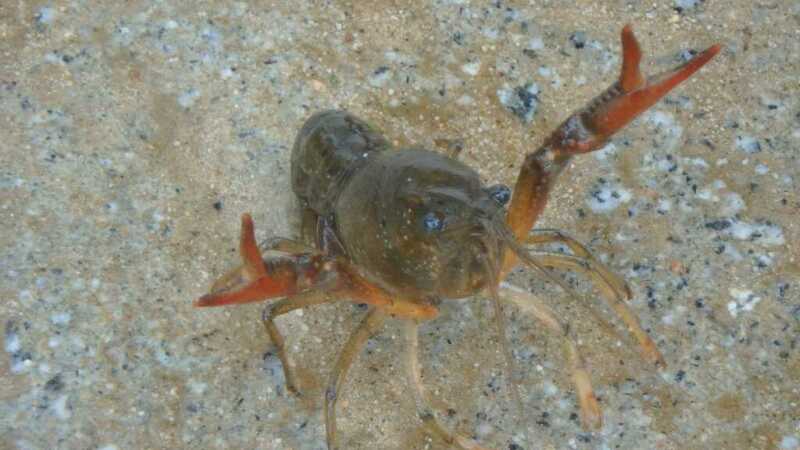 Some net research suggests they may be the tadpole stage of the Iberian Ribbed Newt a large primitive looking creature one of which we may have seen flattened at the side of the road. The dirt track is used by fairly large lorries against which these beasts stand little chance. Another rare sighting is a man riding on a donkey. It is only the second donkey we have seen being ridden in Spain there are also two dogs one of whom is having difficulty keeping up with a front leg injury. 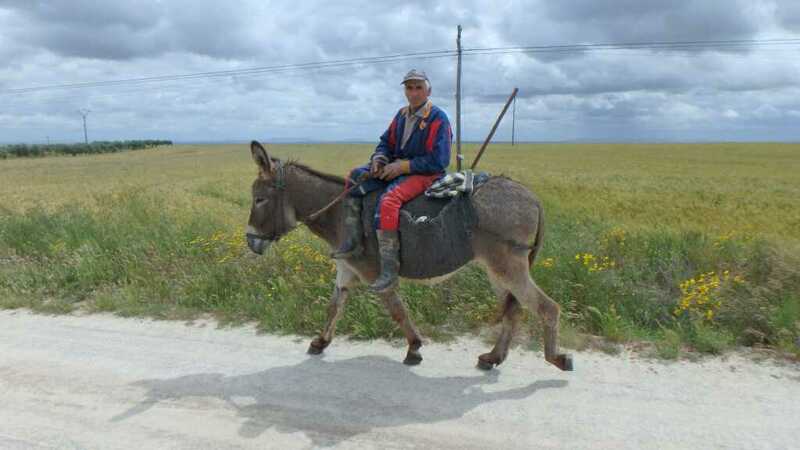 The last ridden donkey we saw was also in Estramadura on the Via de la Plata four years ago. 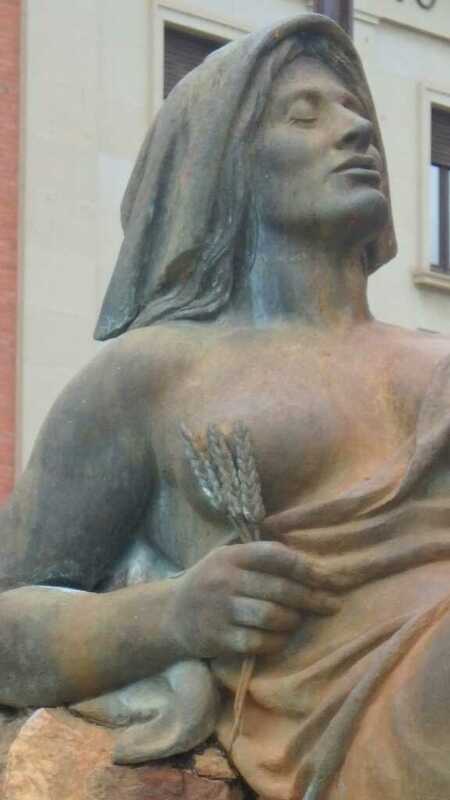 We get contact with the ladies running the alburgue through the Ajuntamiento and are intercepted by one as we leave town. Well it is not a big place, she suggests we eat and ring her when we are ready to set off the remaining kilometre to the railway station. Most of us are on the ball and realise that the old railway station is our accommodation for the night. It is very well refurbished and a very comfortable lodging. We are followed in by two Irish women who are also looking for the alburgue but are a little less organised and have not yet had lunch. A washing machine seduces us into a major wash even though the Ralph forecast promises rain before it finishes its cycle. On Leaving Andalucia or When I get to the border. ﻿Hinjosa del Duque to Monterubio over 20 miles moderately up and down. So leaving the ducks behind, but not unfortunately their weather we head off across the dehesa with no villages, no bars and maybe one place to eat what we bring and rest. 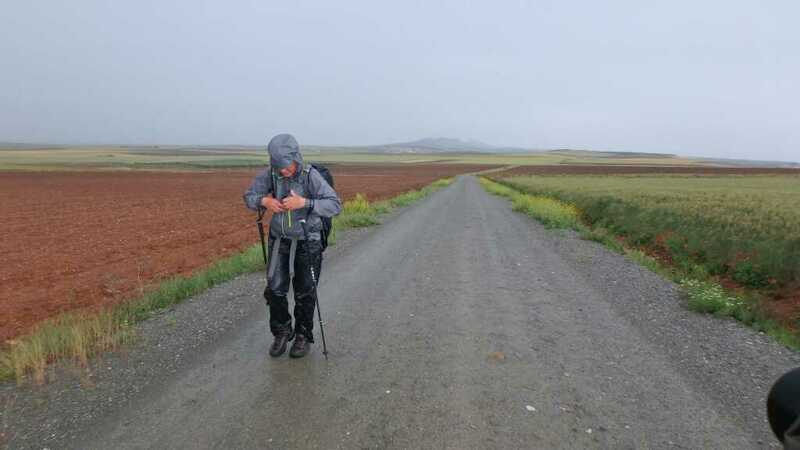 We shared the albergue last night with the Italian (maybe older than us) who was full of doing 50 km yesterday but did the same as us, and today with once again poor weather forecast he is not so bold and is probably heading to Monterubios like us. Conversation is difficult even for Betsy as a polyglot of French Spanish and Italian results between us and him. We are starting by 7.40 and it starts to rain just after, allowing enough time for clothing optimism and the rapid donning of water proofs. 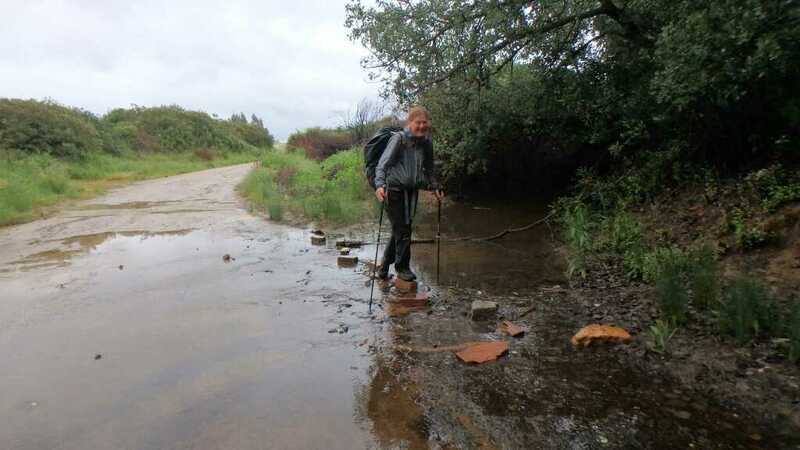 Tim whose water proof socks and over trousers worked well yesterday is in sandals, normal socks and shorts cold feet result but his fun in puddles compensates. It is a miserable day made worse by reports of 25degree heat at home. The large heaps of boulders in fields continue but soon fields give way to Holm oak pasture and occasionally fields of crops and cereals. 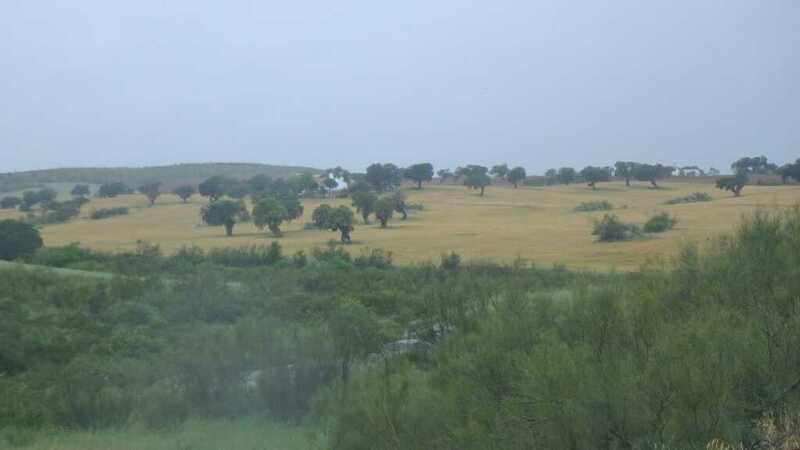 Gradualy the landscape becomes one of dehesa but with large areas of wheat with the usual Holm Oak in the fields. This is particularly pretty as the corn is just turning from green to gold. After a brief stop between rain storms for oranges while being dripped on by an oak tree we next pause at an Ermita, old but done up in the 19th century by a Vicomtesse in memory of her husband. This has a porticoed cloister which we eat in until the rain stops. Only about 8km along the road to town now. The sky looks black. 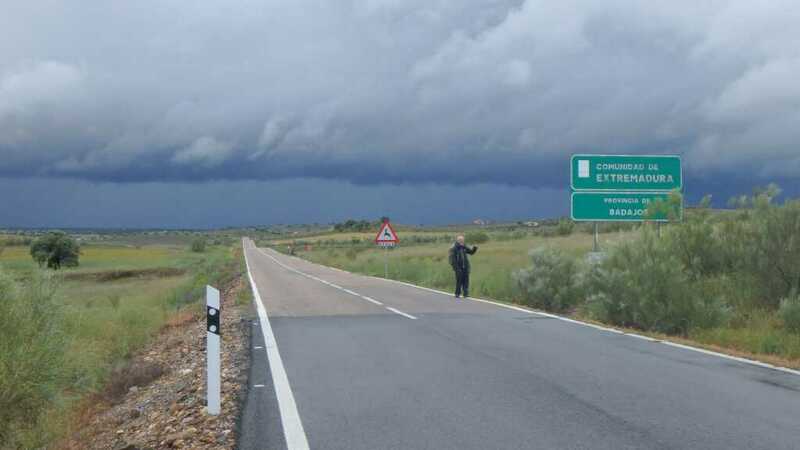 We reach the border of Estradura and shortly after the skies open. A fitting start to our walking in the province named for climatic extremes. 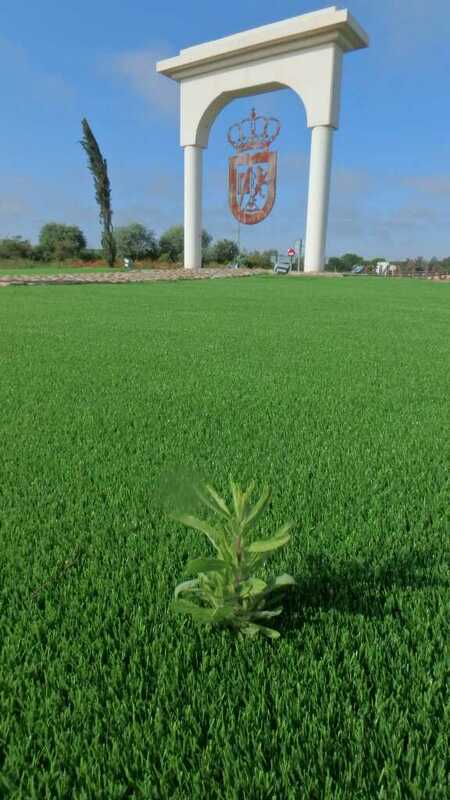 Strictly we are in the province of Badajoz in the Autonomous Comunity of Estramadura. Either way the next hour is cold and wet. The rain stopping just as we enter town. All have had enough and a meal and rest inthe Hostal Vaticano at pilgrim rates is very welcome. Villaharta to Alcaracejos Part 2. 11 miles fairly flat. Sadly we now leave Cafe Bar Mirasierra a very good pilgrim stop. The flat we have occupied for 2nights is well set up with hot water and open and covered drying lines for clothes on the flat roof which has a good view of the local stork nest on the church. 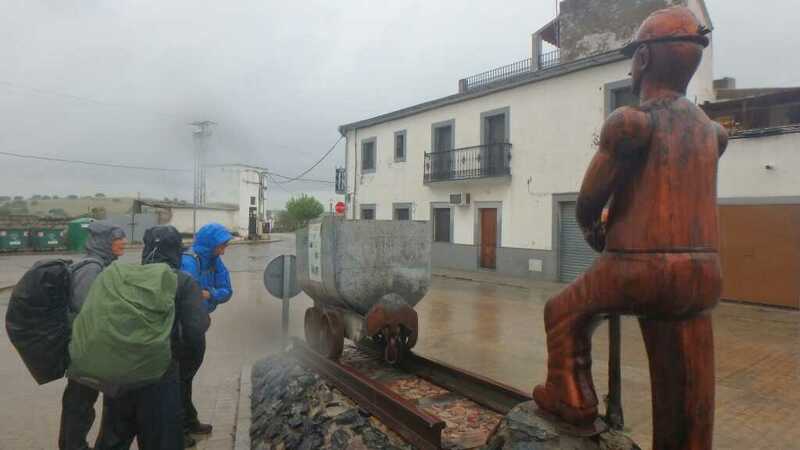 Senor Ruis takes us back to the headless statue off the main road where he picked us up in the rain yesterday and we walk the 800m back to the camino on the Canada Real Soriane the old drove route over the dehesa of the Sierra Morena. 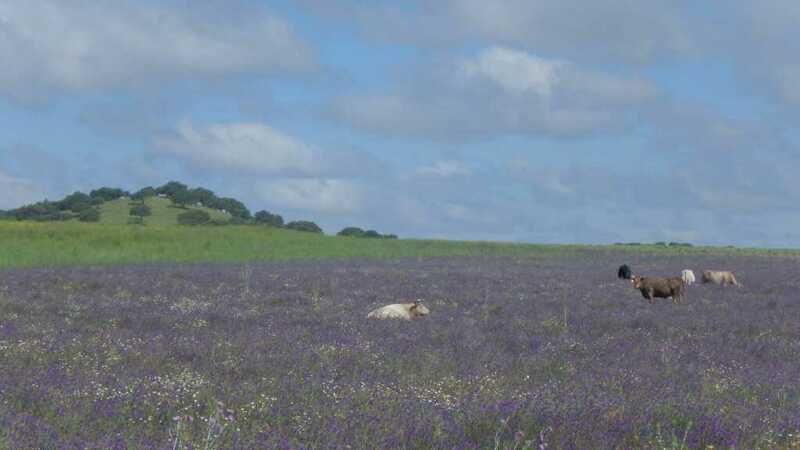 The terrain becomes flatter and more like the typical dehesa of Estramadura, with cistus and Holm Oak dominating the landscape which gradually appears more like the Capability Brown landscapes of English country estates, with well spaced trees and occasional herds of sheep watched over by very large dogs. We expect a wet day but it rapidly stops and removal of layers comences not without trepidation as it appeared to us yesterday that whenever a layer is removed the rain starts again. Today it is not so, cool cloud cover remains but no more rain and a good walk is had by all, none of the stream crossings are a problem no wading needed although puddle evasion tactics are vital. Several hoopoos are seen as well as azure winged magpies just before entering town. 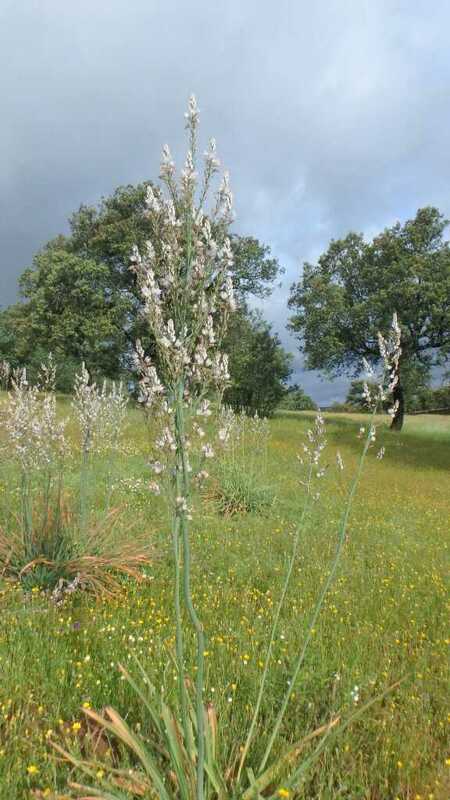 A possible cuckoo sighting, heard close by and the huge amounts of asphodel make it s very pleasant trek. After finding lodgings and the usual housekeeping we go for lunch. A quiet bar with a dining room upstairs which appears in use is fine. Until the wedding party arrives and surges round us. Service and their entertainment continue unabated. We have forgotten it is Saturday. Happily our hostal is out of the way and our windows on the opposite side to the football pitch. We hope for a good night, tomorrow is forecast wet again.